I am pretty bad at getting round to posting updates on some of your more eye popping makeovers. I look at the picture below and ask myself how we ever convinced ourselves you were are lovely house to buy. 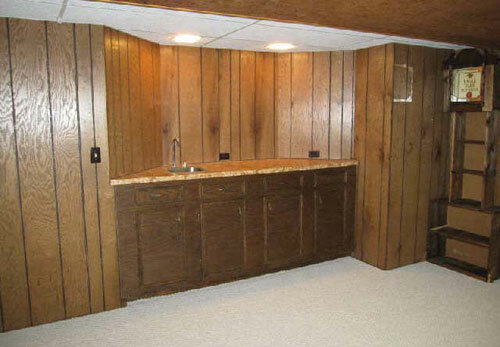 This is the bar area in your basement. Yuck yuck yuckity yuck! I mean there is nothing nice to say is there? ahhh that is so much better, not perfect by any means but it’s no longer quite as disgusting. 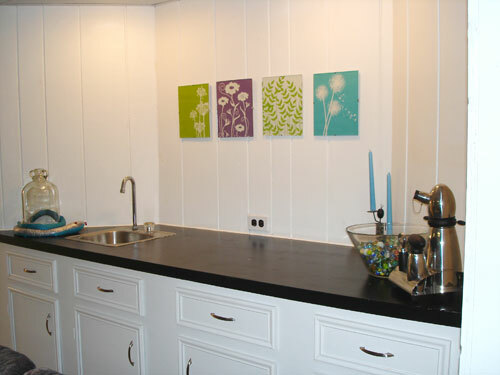 Primed and painted the formica work surface black. My entry into Domestically Speaking’s Power of Paint Party is sponsored by Appliances Online and the Bosch Washing Machines. That is one of the most dramatic before and afters I have ever seen. It looks amazing! Wow, that is so cool- it looks so fresh now! Nice!! Found you from COlor Me Happy – I, too, moved into a very brown house last year and slowly painting it over. Stop by to check it out. I looked at your other pics, you've done a great job and it gives me inspiration! Wow, that looks 101% better. Great job! WOW! That looks utterly fantastic. It's like taking 30 years off of the house! BEAUTIFUL! It looks much much and much better! you did a wonderful job. Thanks for stopping by Beach Cottage Good Life Wednesdays and joining the party. 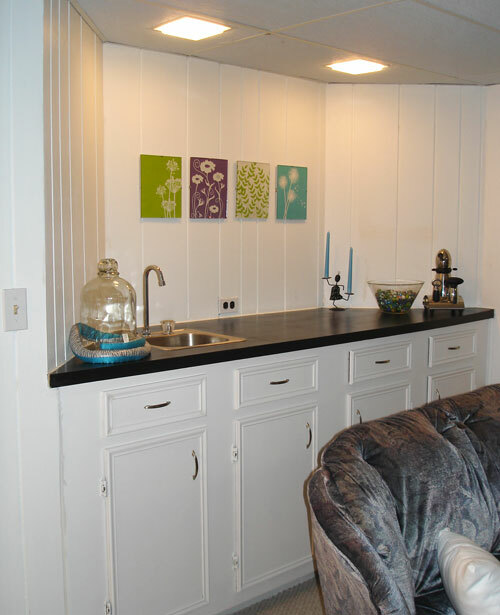 The power of white paint is always a good thing! Love the framed scrapbook paper too!